There are those that say Vegas is like Disneyland for adults. While I love Vegas as much as the next guy, for my money the Napa/Sonoma area of California wine country is more deserving of that distinguished title. With its stunningly beautiful scenery, perfect weather conditions, phenomenal restaurant and foodie scene and of course an overload of the very best wineries in the US… it offers everything the wine loving adult could possibly desire. Upon my last visit I found some new spots that I really enjoyed, but still have my all time favorites from past trips that will always hold a special place in my heart. So while trying to narrow it down to a handful of the very best wineries to check out for a tour/tasting ain’t easy, here are my top picks in each region that are not to be missed on your next wine country excursion. What was once the old Lake Sonoma Winery is now one of the best destination spots in all of Sonoma. 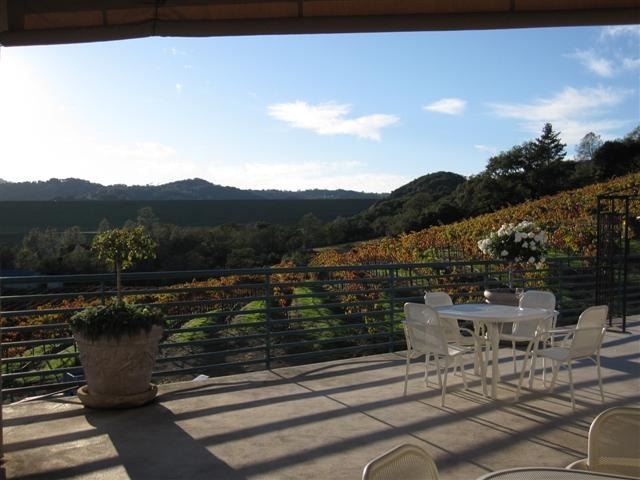 Gaze over the Dry Creek Valley while enjoying some of the finest wines produced in the region. Iconic Napa wine making pioneer Ed Sbragia was producing wine for Beringer as far back as the 1970s and is one of the original winemakers responsible for putting Napa on the map. Now he’s crafting a stellar lineup of Sonoma juice with his son Adam, alongside a super friendly and knowledgeable staff. Ed has successfully created his own family legacy with his impressive portfolio of Sbragia wines. Ed and Adam make quite a number red and white varietal wines you can sample via their various tasting options, and if you catch him on the right day Ed may even taste you through his lineup… which is comparable to playing a pickup one on one game with Michael Jordan. Steve Zichichi was a physician in New Orleans before his second career as a serious winemaker. For years he was just selling grapes from their Dry Creek vineyard, but after Katrina hit his family hard, he and his wife Kristin packed up and went all in with their Dry Creek winery. Since then he has been producing some amazingly powerful, yet elegant, Zins and a Petite Sirah. Some years back he added a Cab to his arsenal, and all of his juice is truly well crafted and ageable. This winery is worth the visit as much for the wine as it is for the southern hospitality and picturesque views. Steve has also been known to grab the wine thief and get into the barrels, which if given the opportunity I highly recommend joining him. If you like extracted, refined and downright tasty Russian River Pinot hand crafted by a mad wine scientist then get yourself to Moshin… fast. Just down the hill from Gary Farrell, Rick Moshin has been producing small lot, high quality Pinot for decades since he retired from his college math teaching career. Having had a hand in producing Pinots for top producers in the region, he eventually purchased his own vineyards and set up shop in the RRV. His line of limited production, single vineyard Pinots are certainly the highlight of the tasting. However he produces a variety of whites, reds, blends and dessert wines… and on the right day he may taste you through every single one (as he did on this particular day from the pic above). And if you can get back there for a barrel tasting with Rick, it’s a treat to see how all those puppies are aging at various stages of their lives. While in the area, it is certainly worth heading up the hill to Gary Farrell as well for their simply gorgeous views and of course stunning Pinot and Chard offerings. I visited here on my first trip to Sonoma some10 years ago… and the memories it provided have not faded one bit. With its flower filled European style garden, the estate itself is worth the price of admission. My wife and I were lucky enough to enjoy our portfolio tasting out on the deck, which is all inclusive of the ridiculous views of the Sonoma Valley as well as some top notch charcuterie. CSJ produces all kinds of varietal wines such as Chard, Fume Blanc, Pinot Gris, Riesling, Cab, Merlot, Syrah, Pinot, Malbec and of course their show stopping high end red blends like Cinq Cepages. The undeniable charm of the estate and those that provide these memorable tastings make CSJ a must visit. This is hands down my favorite winery to visit…anywhere! The drive to get there is a tad treacherous, but if you make it to the winery atop of Spring Mountain you can buy a shirt that says “I survived the ride to Pride”. Aside from the unbelievable real estate, where half of the winery sits in Napa and the half in Sonoma, Tim Bouchet and the entire winery staff are about the friendliest folks you can imagine. A gorgeous interior tasting room/bar leads out to a patio that overlooks their estate vineyards and lake. As for the wines, it is hard to find any winery that has a more stellar portfolio from top to bottom. The Cab Sauv and Merlot are renown for being produced from both Napa and Sonoma fruit, but their Cab Franc may be the show stopper of the lineup. Their cave tour includes barrel tasting of certain single lot Cabs that go into the Reserve Cab, which is as good as any cult wine out there at a ‘value’ price of $140. I’ve been there 3 times now and every time I leave I cannot wait for my next return visit. Off the beaten path in the southern foothills of the Stag’s Leap District is where you will find one of the most underrated, yet extremely impressive, producers in Napa. These guys are quietly crafting some of the best Chard, Syrah and Cab in the region, and doing so at fairly reasonable price points (relatively speaking of course). They have implemented an innovative aging system where the wine stays in bottle for years before release. Their caves have arches carved out in the walls where up to 6,000 bottles are stored in each nook, which is quite impressive to see up close. On a nice day, you can taste with the warm and knowledgeable peeps that work there while sitting at a tree covered, traditional style picnic table over looking their estate vineyards. Needless to say, there are worse ways to spend an afternoon. When it comes to winery visits, the experience can be as important as the juice itself… which Domaine Carneros fully understands. The Chateau is dramatically grand and impressive in every way possible. From the giant stairways leading to the entrance to the gorgeous outdoor terrace complete with hillside vineyard views that go on for miles, this is a true Napa spectacle. And since it is in Carneros, you get that refreshingly cool afternoon breeze coming in from the San Pablo Bay. As for the wine, sparkling is the name of the game here. Founded by the Taittinger family, DC produces a number of various sparkling wines all in the traditional Champagne method… and they are solid to fantastic across the board. They also produce still Chardonnay, Pinot and a couple of other varietal wines for those not into the sparkling craze. There are few experiences as enjoyable as sipping some tasty bubbles while looking over the rolling hillside vineyards with friends and family on a warm summer day on the DC terrace.